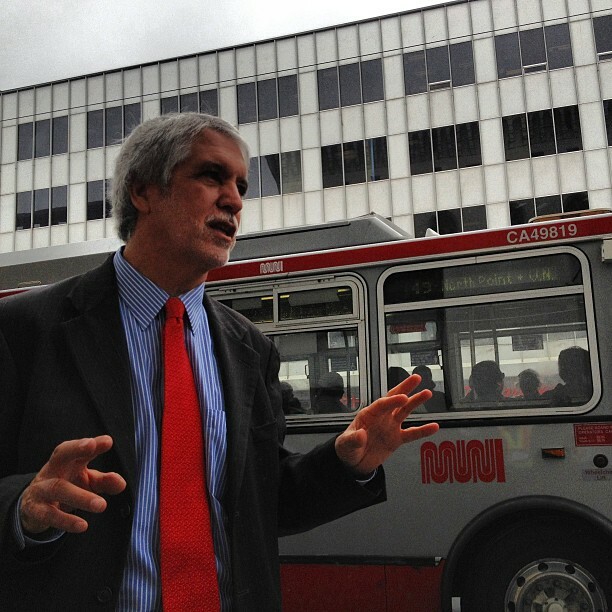 This weekend, San Francisco was treated to a visit by Enrique Peñalosa, the livable streets visionary who spearheaded a transportation revolution as mayor of Bogotá, Colombia by championing ideas like car-free streets, bus rapid transit, and protected bikeways. Peñalosa, who now professes his vision to city leaders worldwide, spoke at Sunday Streets in the Mission and at a SPUR forum. 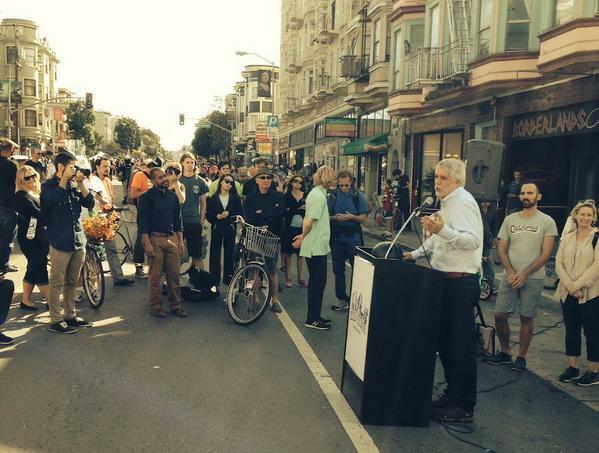 Sunday Streets, of course, was inspired by Peñalosa’s Ciclovia program, which opens many miles of streets every week. In San Francisco, like most cities, the vast majority of street space is devoted primarily to moving and storing private automobiles. In many neighborhoods, even the sidewalks are used for parking — an absurd situation Peñalosa took on as mayor in Bogotá. Peñalosa pointed out that there’s no other piece of personal property for which the public provides free space for its storage. When someone buys a refrigerator, for example, the public isn’t obligated to provide a kitchen. “Asking, ‘where should we park?,’ is like asking where you should put your clothes or your food,” he said, eliciting chuckles and applause from the packed crowd at SPUR. 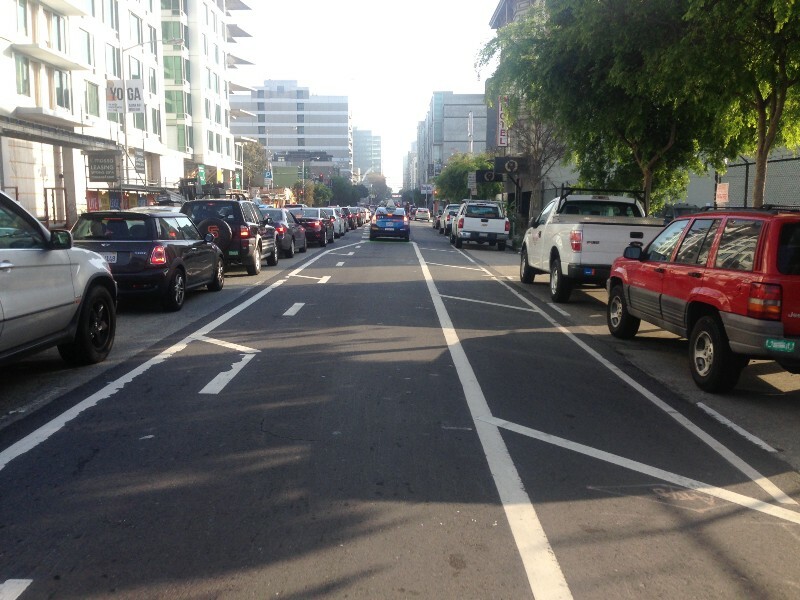 In discussions about people-friendly street redesigns in SF, opponents often complain about an ‘undemocratic’ process whenever decisionmakers don’t yield to their insistence on preserving the car-centric status quo. But, as Peñalosa points out, there was no democratic process behind the decisions to motorize streets that were once a safe domain for children to play in. As Peter Norton has chronicled in his book “Fighting Traffic,” today’s automobile-centric streets are the result of engineering and propaganda campaigns in the 1920s and 30s, which were met with a violent but long-forgotten struggle. “Sometimes, we say, it was so obvious that things should have changed,” Peñalosa added, pointing to the fight for women’s suffrage as an example of an undemocratic state of affairs that was once considered normal. On most of SF’s streets, buses which often carry over 50 people do not get a commensurate slice of the roadway, but instead sit behind private automobile drivers. 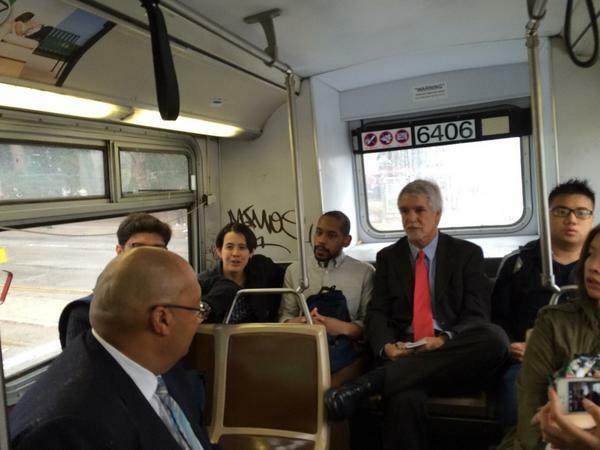 During his visit, Peñalosa took a ride on Muni buses with city officials and planners on Geary Boulevard and Van Ness Avenue, where bus rapid transit lines are planned. The distance between the planned stops on those streets is too close, he said, which will result in slower transit and higher operating costs. Peñalosa also said there’s often a misconception that transit and protected bike lanes are supposed to solve traffic jams by getting people out of cars. To fully address car-clogged streets, he said, car use also needs to be restricted, through efforts like congestion pricing and restricting new parking. He pointed to London as an example of a city with a “great subway system” but that also had to adopt restrictions to alleviate the car crunch in the city center. In fact, Peñalosa said, London has prohibited the construction of parking in downtown office buildings for more than 40 years. 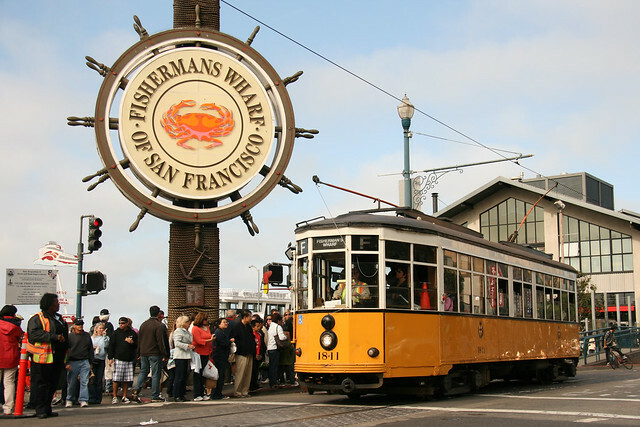 The public planning process in San Francisco is also known for its tendency towards what’s been called “hyper-democracy” — aiming to please absolutely everyone with every single public project. Peñalosa says immediate neighbors of the public right-of-way shouldn’t get to dictate everything about its use. 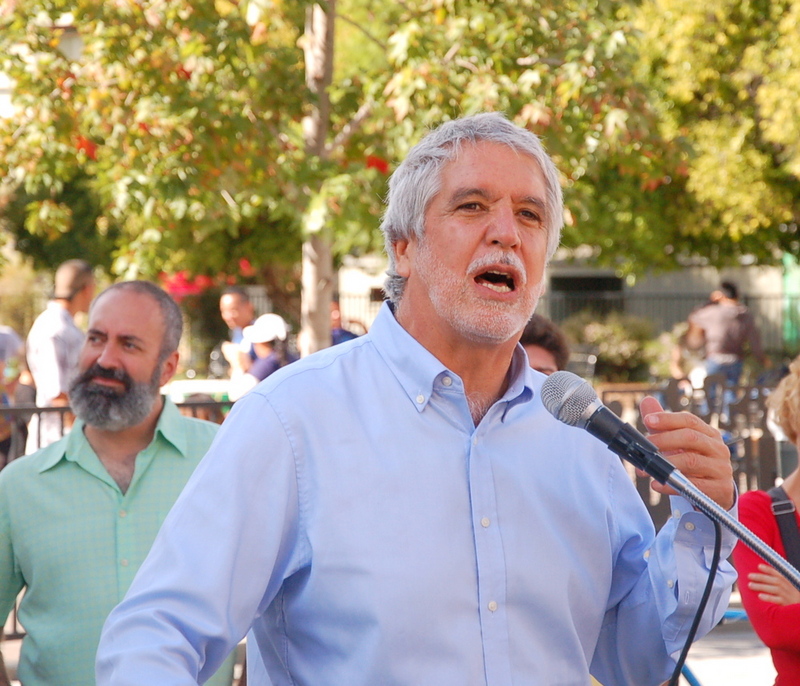 You can see Enrique Peñalosa speak in numerous Streetfilms and in a TED talk. Peñalosa last spoke in SF in 2009. Stan Parkford contributed to this report. Whoa, how did I miss that he was going to be here?! Love his comparison of the inequity of our current streets to other formerly pervasive wrongs such as male-only voting. When steeped in the status quo it’s often really hard to imagine what can or should be. Damn. Was just inspired. “Who voted on this?” ::points to danger-prone, car-centric urban street:: Amazing. I’ve seen that quote about “the rich take public transportation”–is there such a place? There may be wealthy people who ride subways and buses, but I’m sure most of the upper class prefer the luxurious interiors of their Mercedes Benzes, Cadillacs, etc. to rubbing elbows with the common folk on bus or train. And I’ve driven up US 101 through the Salinas Valley and seen better cars than mine parked next to the salad-greens fields at harvest time. Penalosa makes many great points. I particularly like the one about hyper-democracy which is see more as neighborhood rule – when a local action group is give permission by the city to hijack the part of a broader agenda that passes through their neighborhood – this reminds me of the Middle Polk Neighborhood Association, which was successful in making life more dangerous for all the cyclists passing along the Polk Street arterial. For a US example the best is probably New York City. Sure, plenty of high-income people will always be taking luxurious vehicles but for plenty of trips within the city the subway’s often simply faster. For millionaire and welfare recipient alike. The amount of wealth that daily commutes into the FiDi of SF via non-car modes is also fairly high. Too bad that doesn’t always apply to the rest of the Bay Area…or even the rest of SF. I think Peñalosa’s point is not that there exists a place where no rich people or no poor people ever use cars but more that a developed country should have the infrastructure to make something like transit (and presumably by extension also biking/walking) such a safe, prevalent, convenient option that large cross-sections of society of any and all means regularly do it as a regular, no-brainer thing. You can see how the lowest income stratum in Denmark (defined as less than $13k annual income) still actually drives for 45% of its trips. *But it’s not weird to not drive*. You’re not a loser or eccentric if you show up to a job interview or do your shopping on a bike. This has huge implications in terms of dignity, self-determination and simply being able to get things done, work and go about your life without needing the costly buy-in and ongoing expenses of a car in the first place. Btw, those bike numbers are probably quite a bit better amongst the poor in the Netherlands, because they’re quite a bit higher overall anyway. The NL is still a fairly car-crazy country but has notably higher bike modeshare (and more prevalent and protected infrastructure) than Denmark. I’ll have to look some stats up and see what I find. I know many relatively rich people. In my experience, they value their safety first, then their time, and then their luxury. If public transportation is safe and goes faster, they’ll take it, otherwise they’ll drive. NYC mayor Michael Bloomberg, for instance, famously took the subway daily during his pre-politics working years. The choice of public transportation — in most rich countries outside of the U.S. — is not about money, but about preference. One of my Italian friends, well-off but not wealthy by most occidental measures, prefers taking cabs everywhere. She, at least, hates mixing with the hoi polloi. Average income of a Caltrain rider is 6 figures. Scroll to Figure 2.10 on page 25. You can see the usage amongst income groups starting with “meer dan €3200” (more than €3200) on down. Looks like the poorest (monthly income below €700) bike the most with almost 60% biking daily, though even half of the wealthiest bike daily. Point taken–I’m reminded of a story from 1951, about a well-to-do businessman who lived in San Marino and usually took the Pacific Electric Red Car to his office in Los Angeles. Occasionally, if he had a meeting outside downtown during the day, he’d take his car (probably a Buick or Packard) to work, but normally he relied on the PE. One morning in Oct. 1951, his wife noticed him heading for the garage rather that the front door. “Oh, you’re taking the car today.” “Yes, the PE isn’t running anymore.” “I read about that in the paper; they’re running buses on Huntington Drive instead. Couldn’t you take the bus?” “Certainly not! Buses are for poor people.” To this day, rail is seen by many as being more appealing to “choice riders” than motor coaches. “regular, no brainer thing”–that’s the key. Right now, the majority of Americans automatically head for their garage or driveway and hop in their car, SUV, minivan, etc. Using public transit takes more planning, especially if the bus or train runs on longer than 10 or 15 minute headways. 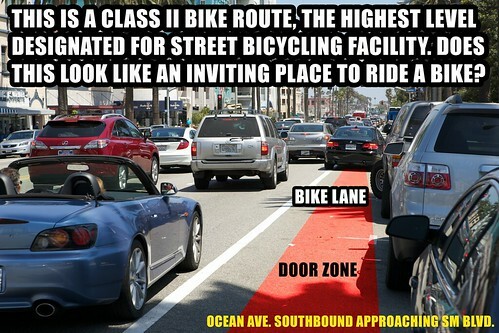 Bicycling may take careful route-planning, or may be impractical, uncomfortable or dangerous. Only when hopping on a bike, or walking to the transit stop is the first choice will we be seeing “car-centricity” starting to fade. And regarding “It’s not weird not to drive.” Many years ago, I filled out a job application that asked what kind of car I drove and what year model it was. The company must have had employees who had attendandance problems because of old, unreliable rides. This was in the area east of downtown Los Angeles, and as one might guess, the plant was difficult or impossible to reach via local transit. No one lines up like that for a bus.